Posting photos and videos that feature your products, events, discounts, and special deals is a great way to advertise your brand through Instagram. This is very important, especially for those in the fashion, beauty, clothing, arts and crafts, and the modeling industry. A picture, they say, paints a thousand words. With Instagram, a photo can do much more than that. It can go viral and reach thousands or even millions of viewers in minutes, showing just how powerful Instagram is for influence and online reach. Instagram is one of the most powerful social media networks for selling online, and in this post I list the top 10 tools to help you do so. Shopseen lets you automatically upload product images from your own Shopseen online store to different ecommerce stores and social media. One great feature of Shopseen is that it displays your products on Etsy, Woo and Ebay. To do that, you need to link your accounts, including Instagram, with Shopseen. On Shopseen, online sellers can add the product name, description, tags, supplier, weight, and shipping details. After which, you can post products in various eCommerce stores, and share it on your social media accounts or pages including Instagram. It also automatically updates the product galleries across these channels. Wishpond lets you create contests on Instagram by using hashtags. The winning photo is the one that gets the most votes on the seller’s Facebook page or website. It is a great tool to have if you’d like to attract more followers, earn more Facebook likes on your page, and extend your reach online. In addition to that, Wishpond also has great features for online sellers, helping them create landing pages, website pop-ups, forms, and email marketing. These features will help you get more leads, gain exposure, and increase profits. InstaOrders lets you convert your Instagram profile into a marketplace in minutes. To activate this feature, you must register on their website, where you input your details. InstaOrder imports your photos and sets up your store. After which, this program automatically syncs with Instagram. Voila, you are now ready to take and receive orders! Inselly rides the hashtag phenomenon to connect people on Instagram. Online sellers can maximize Inselly by using hashtags with their products, events or promos, so that it will be searchable by anyone on Instagram. Add the hashtag “#inselly” in the description of the image of your products. You’ll often see #inselly with hashtags like #etsy, #summerfashion, or #handmade. Buyers can also search for products by category with Inselly, which makes it easier for them to shop. They can also search for photos using hashtags. On the flip side, sellers can turn their Instagram feed into a marketplace that allows users to click on an Instagram image, shop, and buy in the online shop powered by Inselly. To install this app, you need to register and connect your account with Instagram. One thing that makes it one of the best Instagram marketing tools is that it’s free to use for both sellers and buyers. Have2Have.It lets you advertise your products by featuring photos from your Instagram account with a direct link to your online store. 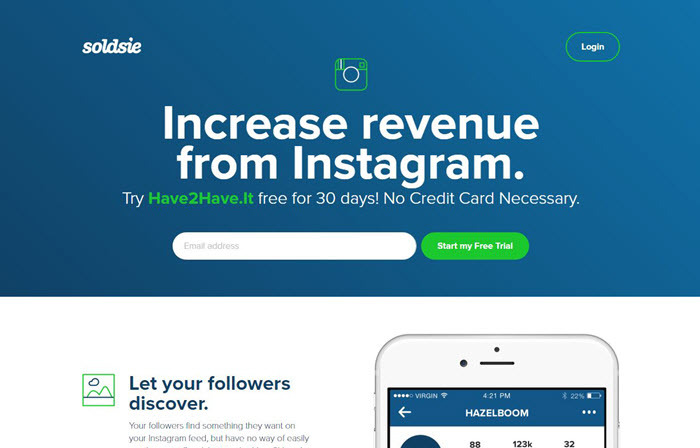 For those who do not have hundreds of followers on Instagram, this tool comes in handy to bring customers to your site. This feature helps Instagram browsers who see a product they want to buy but have no idea where to find it. For those selling online or planning to sell online, try out the Letsell.It application. You simply need to register, add photos, and write descriptions of your products in Letsell.it. After that step is complete, this clever eCommerce tool posts it on Instagram for free. With this app, business owners can advertise their products directly in front of thousands of customers who are also using the app. When your products are sold through Letsell.it, they only charge a small fee. A notable, great feature of this app is it lets you chat and message with buyers who are interested, which leads to higher conversion rates and customer satisfaction! Both buyers and sellers need to have this app. Oh, and did I say, it’s free. Soldsie lets you have your own storefront connected to your Instagram account. It is an online shopping platform on Instagram where you can post and sell your products. It’s a great way to advertise your company and gain exposure because it essentially links your shoppable photo gallery with your Instagram, making the ‘sell’ only one click away. We all know that video content sells, right? Flipagram allows you to post short video clips with matching music on Instagram, making it a leader in Instagram marketing tools. You can also make a compilation of photos or video clips using this app. It’s a great tool to showcase your creativity on Instagram by sharing how your business started and why your products are a cut above the rest through a Flipagram video. Plus, it’s very easy to use and free! Heyo lets you create a contest, games, promos or special deals on Facebook and Instagram. It is a DIY builder with drag-and-drop features that lets you create a campaign for social media. For those running a campaign on Instagram, hoping to widen their customer base, Heyo is a great tool to use. It’s excellent for customer acquisition and will save your marketing budget. Online sellers who use Like2buy can have their own gallery or storefront of products on Instagram, which are available for purchase with one tap. This platform provides a page where sellers can feature their products, promos, events and special deals. Instagram followers are seamlessly redirected to the storefront by clicking on the link, which is provided by Like2buy after registration. Always keep in mind that Instagram is a beautiful social network, meant not only for selling but also for engaging, socialising and interacting with people. Get real, get social, and start selling on Instagram! What are some of your favourite Instagram marketing tools? We’d love to hear your thoughts in the comments below! Susan Delly is a Writer for PinnacleCart eCommerce software. PinnacleCart is an extremely powerful shopping cart builder application that is designed to drive traffic and increase sales helping customers to cost-effectively & rapidly deploy a successful web-based business.